Herndon Davis, an artist and journalist, dedicated his life to depicting the major landmarks and personalities of Colorado in watercolor, oil, and pen and pencil. Best known for the Face on the Barroom Floor, the portrait of an alluring woman on the floor of the Teller House Hotel barroom in Central City, Colorado, Davis was a prolific artist whose murals, sketches, and portraits can be found all over the state, from the Sage Room of the Oxford Hotel on Seventeenth Street to the Denver Press Club poker room. Despite his numerous contributions, his work was never showcased or exhibited in the traditional manner. In this biography and first-ever collection featuring most of his life’s work, authors Craig Leavitt and Thomas J. Noel provide a detailed look into Davis’s life and career and include a catalog of almost 200 photographs of his work from Colorado and around the country. They also put his work into the broader context of the time through comparison with such contemporary Colorado artists as Muriel Sibell Wolle, Allen Tupper True, Charles Waldo Love, and Juan Menchaca. 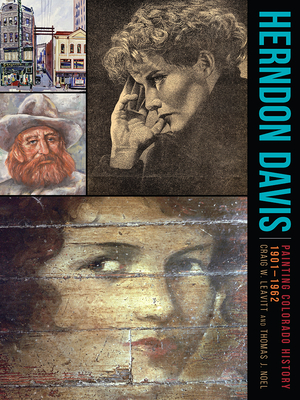 Published to coincide with the Denver Public Library’s 2016 exhibition—the only public display of Davis’s work to date—and bringing deserved attention to this overlooked figure, Herndon Davis: Painting Colorado History, 1901-1962 is an important contribution to Colorado’s cultural history. This book and the accompanying exhibit are sponsored by the Western History/Genealogy Department at the Denver Public Library. Publication originated and supported in part by Diane B. Wunnike. Craig W. Leavitt is social media manager and research assistant at the Center for Colorado and the West at Auraria Library. A graduate of the Public History and Preservation MA Program at the University of Colorado at Denver, he is a former Koch Fellow at History Colorado and the current Center for Colorado and the West at Auraria Library Fellow. He has published in Colorado Heritage Magazine and the Historical Studies Journal, has served as chief editor of the Historical Studies Journal, and is coauthor of Colorado Newspapers: A History & Inventory, 1859–2000. Thomas J. Noel teaches history at the University of Colorado at Denver, where he is the director of Public History and Preservation and codirector of the Center for Colorado and the West. He is a columnist for the Denver Post, a former National Register reviewer for Colorado, and a former Denver Landmark commissioner. He appears regularly on Channel 9 (NBC) as Dr. Colorado and has authored or coauthored forty-four books on Colorado. "Readers who are interested in Colorado's art and history will welcome this cornucopia of paintings and drawings by Herndon Davis. . . . this book is a treasure."